I have read quite a few non-fiction books written by former Jehovah's Witnesses before. Some were more comical in their approach, others were more serious. This one was more edgy, after all, the author wrote about themes not only about exiting a cult, but also about homosexuality, drug abuse, and dissociative identity disorder. 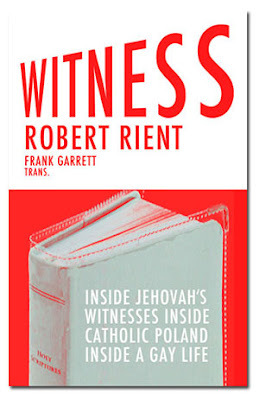 And I must say that after reading this book, I think I won't be reading any more accounts of former Jehovah's Witnesses leaving the cult. I think I am ready to move on. Perhaps I am influenced by the author. He had one identity yet opted to kill it completely. Ironically enough, the Witnesses liked talking about the so-called "double life" which they refer to the idea of having one personality being presented in the presence of believers and another to non-believers. Obviously they discourage you from having a double life, but a lot of people actually had. Even I did. And so did the author. It just happens that he killed the former personality and stuck with the second one. This book is actually written with an interesting narrative structure: there are two voices written in the first person, Luke and Robert. They're more or less talking to each other, Luke corresponding to the former personality and Robert to the new surviving one. Luke was the one who was raised as a Jehovah's Witness, and eventually dies. Robert is the one that was created as a survival mechanism, and eventually stays around. The remaining third-person narrative provides some background on how the Witness belief structure is, enough to provide clarity to the outsider reader. I must say that the author is fortunate: his parents opted to stay in contact with him, as well as with his unbelieving brother. Most Jehovah's Witness parents actually disown their children when their children decide to leave the faith, mine included. In any case, like I said earlier, I think I am ready to move on. I left the Jehovah's Witnesses cult in 2008, and I spent the next ten years fighting this organisation, at least mentally. But after ten years, I also realise that I don't need to be obsessed about it. Yes, there are still very bad things this organisation is doing. The child abuse cases are still piling up left and right. I am not forgetting that. But I also want to enjoy my life, and so I don't want to devote my mental energy into dealing with skeletons from the old closet. You may have noticed that I took down the links to websites that are critical of Jehovah's Witnesses. I am still critical of them, but I don't need to look at them on a regular basis. I also stopped following these channels in social media. And perhaps this is the last book written by a former Jehovah's Witness that I would read. Every story is very similar, including mine. And I want new stories. I want to move on. I don't want to be disturbed by elements from the past, especially when these are elements I don't really like. So why not cut off the past completely and face the future? This book pointed me to the right direction. I give it 4 out of 5 stars.